Carol Cousineau exceeded our expectations. She offered additional ideas of what to say and the sand ceremony. She helped to make it that much more special. We wanted to make our wedding more of a family affair because it was the joining of my son and my new husband and I as a family. Carol suggested he read a poem called "family". It was a very special moment my son will always remember. Just want to say a big thank you to Carol Cousineau. Carol you were awesome and can't thank you enough for helping to make our day so special. Carol(Cousineau),We just wanted to take this opportunity to thank you very much for officiating at our wedding. You did a fantastic job and we would recommend you to anyone. You were always on time for meetings and most importantly for the day of the wedding. You had an air about you that really put us at ease on the big day. I really appreciated the little lace handkerchief you gave me. It’s now in our wedding photo album as a keepsake. 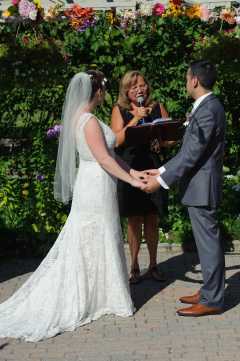 Carol Cousineau was the right person to conduct our ceremony. She is knowledgeable and observant; a kind and gentle person with a sense of humour! She coached us through the intricacies of the ceremony from the entrance to the toast, delicate details that were well appreciated. Our wedding day was exquisite; all of our guests felt welcomed and relaxed. Tom and I savoured every moment. Carol, thank you for all that you contributed to making this day a memorable one. The staff was exceptional, by that I mean good customer service from the time we made initial contact and for the duration of the planning stages. I am an event planner so I am experienced in dealing with a broad variety of people across the country. Your website is very informative and user friendly for those who need the step by step. You have a wonderful organization in place. Carol Cousineau was amazing. She helped us get everything in order and created a ceremony that joined both of our families together. It was more than a wedding ceremony and we were thrilled to have her perform it. All Seasons Weddings was the perfect choice for us. We were very happy with everything as all the little details were covered. She brought up things that we did not know we needed to do to ensure all of our bases were covered before, during, & after the ceremony. The ceremony was perfect and we were thrilled with the end result. Hi Carol (Cousineau), We just wanted to thank you so very much for leading our special day! You did a fantastic job at making sure our love was united with finesse and we truly appreciated it. The flow was perfect and you were part of the wonderful memories we will cherish forever! We are soooo glad that you accepted to perform our wedding ceremony, especially on such a short notice and you did everything perfectly! We are very pleased to have met you and had everything turn out the way it did, perfectly! We will definitely recommend “All Seasons” to anyone we hear may be looking to get married in the future as the whole team were absolutely great! Carol Cousineau far surpassed our expectations. Not only was she friendly and well spoken, she was also very knowledgable and organized. She gave us ideas for the ceremony that we would have never thought of. She made our special day that moch more special. From the first meeting to the ceremony she made us feel relaxed...what could have been very stressful didn't feel stressful at all. Thank you so much! 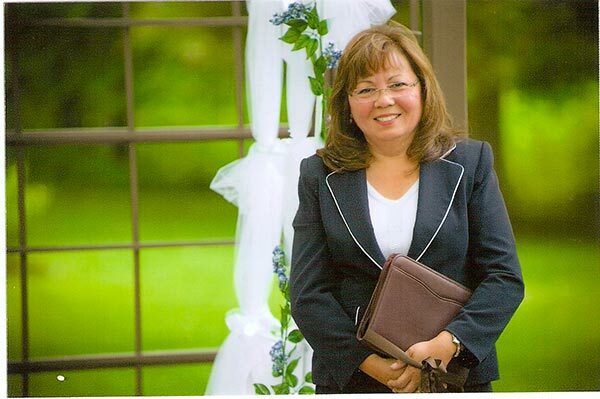 We are more than happy to have had Carol Cousineau as our officiant. She was more than friendly and helpful There was a delay in our ceremony and her patience is extremely appreciated. I would definitely recommend her to any couple, especially any Persian couples, since she is quite familiar with the Persian traditional ceremonies and customize ours with a Honey ceremony. In addition, her personality helped us to enjoy every single second of the ceremony. Carol Cousineau was amazing. We had to plan a local wedding at the last minute because a family emergency prevented us from going through with our original plans. Carol was very accommodating and met with us just over a week before the ceremony. She really took the time to get to know us and to tailor our ceremony to tell the story of our relationship. She even had a draft ceremony ready for us that same evening! She was a pleasure to work with and everyone at our wedding commented on how great she was. Thank you for all your help! 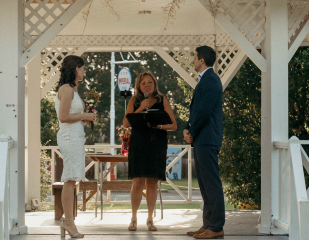 Carol Cousineau was an absolute pro and was invaluable in putting our ceremony together and making sure everything went according to plan. We wouldn't have know how to plan out the event without her. Also we both felt that she really took the time to understand us as a couple, which we really appreciated. Our guests really enjoyed the ring warming ceremony that Carol suggested. Carol Cousineau was the best. She was so kind, patient, and created the perfect wedding for us. We had never heard of a ring warming ceremony before, and after Carol explained it, we knew we had to include it in our wedding. She has a way with words, and anything we could think of, she came up with the perfect way to say it. Thank you for EVERYTHING Carol, you really made our day perfect. I wanted to thank you very much for the wonderful ceremony. It was perfect! Dean and I really enjoyed it and based on our guest's comments every one else loved it as much as we did. We also received your card and really liked your comments. Again thank you very much for all that you have done and contributed in making our special day absolutely wonderful!!! Carol, thank you so much being part of our wedding day. You did an amazing job and made our ceremony so special and you made it feel like it was just as special to you! Thank you! Carol Cousineau exceeded our expectations. She was fantastic! Thank you to Carol for her excellent services! 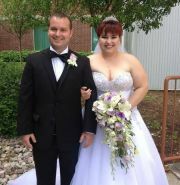 Shawn and I want to thank you from the bottom of our hearts for the lovely ceremony you performed. We loved it! It was us 100% with some laughter and some tears of joy. As mother of the bride, I can honestly say that she helped them create a very lovely, intimate and "them" wedding ceremony. She looked professional, spoke beautifully and had a warm presence that all worked to create a beautiful ceremony. She suggested that we reverse the traditional seating arrangement so that we sat opposite our daughter and it was perfect, because we could see her face the entire time, rather than her back, as is typically the case. Great suggestion! 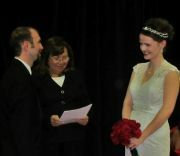 She was key to the success of their ceremony, and we were really happy to have her officiate. Couldn't recommend her more highly. we want to say thank you for being our wedding officiant. We couldn't have asked for a better day! Everything went so smoothly (save for one nephew refusing to walk down the aisle! :) ) We have received many compliments about the ceremony and our promises. It was a day we will never forget! It was a real pleasure working with you, so thank you again. Carol, thank you so much for doing our wedding ceremony. We had so many people say how much they loved the simplicity of it, the warming of the rings and how it was very much us. Thank you for making our moment about us and helping us with our vows. WE LOVED IT!